After a 1-day/2-night stay at Fort Ilocandia, we went our merry way to continue the last couple of days of our 5-day road trip. We were planning in leaving Fort very early but we decided to take advantage of the free breakfast at the hotel so we won't travel with empty tanks. So instead of leaving very early, we left around 8 in the morning. Destination...Pagudpud! But since it's a road trip we had some stops to make along the way, right? And our first stop was "Bantay Abot Cave". Hmm...what could it be? It's actually a sunken ship. Apparrently, it's a Taiwanese ship that docked along that shore for shelter but was stranded instead. The husband read about it somewhere and wanted to see it in person. See how excited he is??? Yeah right! He's just hamming it up....just like always. Maybe he was an actor [a very bad one at that?] in his former life. Anyway, after making those 2 stops along the road we made one more stop before lunch. 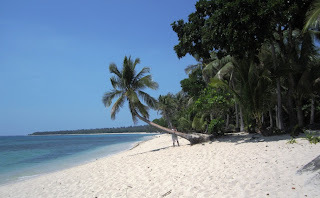 We checked a resort which shares [I think] the same shoreline as the the famous Saud Beach. It's called 'Hannah's Beach'. We were only there for a few minutes. Just enough time to get a brochure and have some picture taking. This was taken from the driveway of the suites/apartments of the resort. Nice view, eh? The rates were okay I guess. But if you have the dough to splurge I recommend you get the presidential suite for a little less than 30 grand PHP. 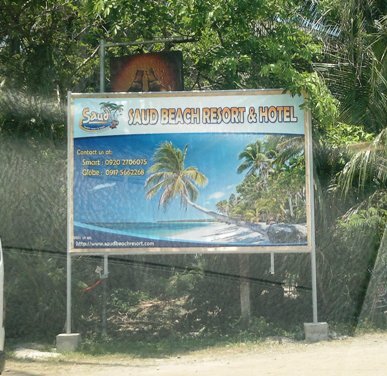 A few miles down the road is the more famous Saud Beach. Unlike the other resort, there were very few people here. I don't know why. The other resort is more like a public resort I guess so people flock to it. I really have no idea why because this place is much better looking if you ask me even if they share the same shoreline. As soon as we finished eating, we did what true tourists do in situations like this. Take a bunch of pictures...of course! The little one relaxing in one of the several hammocks strategically placed in front of the resto overlooking the beach itself. You can just jump into one after filling up and nap....just like what our little 'bakasyonista' did! Well, she didn't actually nap...just posed. Of course we won't be outdone....Mommy and the little one posing by that fallen coconut tree that we see in the resort's banner. Ako yata ang nag-enjoy ng tunay dito sa trip nyo sa Pagudpud. Ang ganda talaga 'no?! Buti pa kayo, you've already seen that Bantay Abot Cave. Dami pa palang dapat i-discover sa Ilocos. Btw, is it really you and E in the last pic? You're almost of the same height na! Grabe, ang tangkad nya! Hanggang sa muli. Have a great Sunday!